Pierneef Restaurant is situated on the La Motte Wine Estate in Franschhoek, the gourmet capital of South Africa. The name of this Franschhoek restaurant was inspired by La Motte’s admiration of South African artist Jacob Hendrik Pierneef (1886 – 1957). 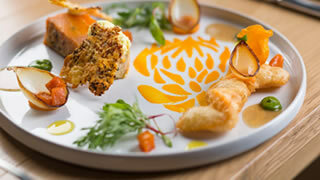 The unique food styles and diverse flavours of Pierneef have been inspired by centuries of cooking, spiced by influences from across the globe, forming the precious ingredients of Cape Winelands Cuisine right here in Franschhoek. The Pierneef Restaurant interior blends beautifully with the external surroundings – a fresh, natural look inside is embraced by tranquil gardens and majestic oak trees – where a Winelands Tea with a selection of home-baked delights from the La Motte Farm Shop can be enjoyed. Pierneef at La Motte Restaurant introduced its Chef’s Table for visitors requiring an intimate area for entertaining guests in a rather exclusive fashion. With an appealing glimpse of activities in the kitchen, the Chef’s Table is secluded from the traditional restaurant area, affording guests an atmosphere of privacy. What sets the Chef’s Table apart is the cuisine offering as well as the freedom of being able to plan a personal menu and wine list with Chef Michelle Theron as the creative guide. Passionate about Cape Winelands Cuisine – the unique traditional style of food served at Pierneef La Motte Restaurant – Michelle delights in creating the ultimate menu and ensuring that both host and guests surrender to a gourmet food experience perfectly partnered by a hand-picked selection of wine.